This is WinWorld a public service announcement. Recently eBay began redirecting URLs of most completed listings to a "related item" page. WTF eBay? How does this even make sense? Sold/ended listings already get stuffed up with lists of "similar" items. At least when showing a small list of a dozen or so items it is more likely that one of them might actually be of interest. And it was already normal that after a few months the listing would disappear and any old links or bookmarks would redirect to a generic search page instead. But instead you want to shove our faces in to something that is COMPLEATLY AND TOTALLY UNRELATED! To the end of a URL will prevent it from redirecting. Shows you the sold item. (And wow, that sold for a lot). Well, there is no guarantee eBay will never change this, but for now I encourage everyone to tack this on to the end of any eBay URL (or after the "?" if there is already one in the URL) when posting eVilBay links. eBay, thanks for giving the world yet another reason to wish there were a viable competitor to you. Never under any circumstance use GSP to ship anything rare, especially if you sold it for less than what it was worth. They will claim it is "undeliverable" and re-sell it for more. They also commonly remove packaging, rending new-in-box items worthless. That's why I use Amazon for my online junk shopping. Thanks for bringing this up with us all. Seems like Ebay got lots of complaints. Now they still redirect, but have added a box at the top of the screen to "VIEW ORIGINAL ITEM". Ug. Of course the moment I post about it they change it. It's still a pointless change. When you publicly see stuff like this get so messed up, you just know Dilbert's Pointy-Haired-Boss is running the show (in to the ground). And for music shopping I suggest Discogs. I was very supprised that was happened. So I began to add "?nordt=true" on list. I don't ever see that happen, and I'm an eBay member. However, whenever an item I'm interested in is no longer available, and I go to the page for that item, it does show similar items for the sold out item. But that's probably different. I've tried Discogs 3 times and had issues with every purchase so far. I'm trying one last time, hoping to get the first CD pressing of Jethro Tull's Heavy Horses, from Germany. 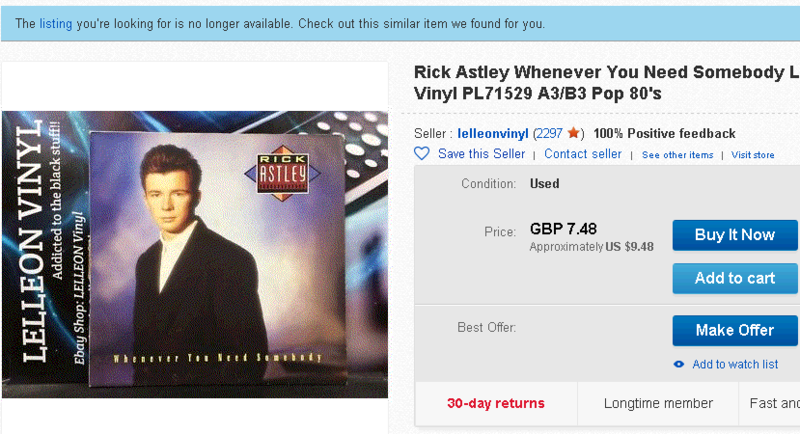 If that one isn't right, I think I'm done with Discogs. Also, did we just sort of get Rick Rolled? Ug. In the very rare case where the "found" item is actually what I want (for example the seller re-lists as a different item so the ended listing does not have a re-listed link), there is no way to dismiss the original item - so I still have to manually search for it to get the right page! I guess we are stuck with this madness.